First of all, my sincerest apologies for being out of touch for so long. On the last day of my 9-to-5 job I made the mistake of diving straight into long, intense days working on my business. I was so excited to finally be able to devote all of my time to building my dream that I forgot to take care of myself by giving myself a real break after almost a year of constant grinding at my job, getting my coaching certification from the Academy, participating in Mastery: The Business of Coaching, and launching Heather Rebecca Wilson International LLC. Before taking off for Boston in mid-July I got really ill (I’m OK now, thank goodness). It didn’t take long for me to realize that this was the universe’s way of forcing me to slow down. I then decided that I would just enjoy myself in Boston and Providence and resume working once I arrived in San Francisco. After three different energy healing and acupuncture sessions in LA (stay tuned for more on that later), it finally dawned on me that I’m undergoing a total paradigm shift in terms of the way I live my life. Changing gears like this requires coming to a complete stop before going in another direction. I’m transitioning from living on solid ground with a 9-to-5 job with a regular paycheck to totally relying on my own intuition and divine guidance as an entrepreneur. My life is now about trusting that I will be supported by the universe to be of service to clients all over the world that need to hear MY message through my unique lens of experience. It’s a new way of thinking and being in the world based on trust that I will be guided in the moment to take the next right action. After a week of soaking up the magical energy of San Francisco catching up with college friends, two weeks in sunny LA celebrating with my Academy sisters, and now this week in San Diego with two hot yoga classes under my belt, I’m finally feeling like I’ve come to a complete stop. I’m now ready to re-emerge and live the big life that I know is meant for me as an entrepreneur, speaker, coach, and spiritual teacher. The truth is, I don’t know where my money for second half of September is coming from. However, I’ve actually never been this happy or felt more liberated in my life. I’m taking a huge leap of faith and it absolutely feels like the right thing to do. I’ll be sharing more about this in upcoming newsletters, so stay tuned! "I'm 50% Colombian and so proud to be multi-racial. It's a huge part of my identity and I realize I don't share that side of me enough through my brand or online (that's changing quick - wait till you see my upcoming photoshoot images!). 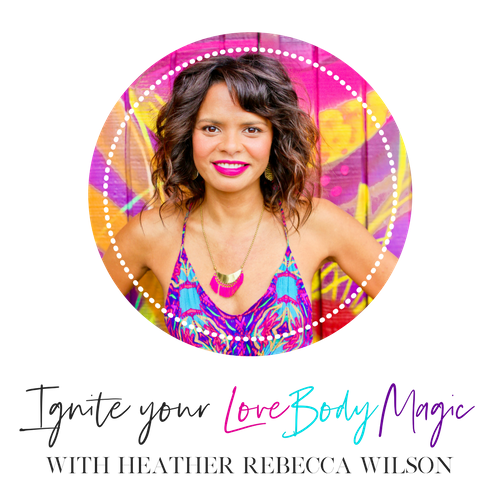 Heather Rebecca Wilson has been someone who has taught me how to OWN my diverse cultural background and why it's so important to be your truest self... not only because that's where your power comes from, but also because that's how you stand out! You know I'm all about standing out, making your mark and showing up authentically online... so I'm super excited to jump on Blab this week with Heather to talk about our experience being multi-racial businesswomen and why you should own your cultural background if you want to stand out in your industry!" Thanks again for your patience and see you on Blab on Friday! P.S. Are you in Periscope yet? Follow me @hedabop and join the conversation on the hottest new app that everyone is buzzing about. P.P.S. My tele-course, “Master Your Mix: The Multicultural Woman’s Guide to Success” is launching VERY soon. This course is for smart, creative, and ambitious women from ANY background who crave a deeper, more integrated, and culturally competent understanding of their leadership identity and vision for the world. Be sure to check your email for the official announcement - those of you on my list will be the first to know!